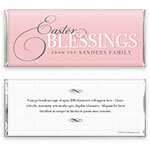 Swirling script and classic style make this elegant candy wrapper the perfect choice for your Easter celebration. Design: Elegant script and mixed fonts. Personalization: Front name and back message.